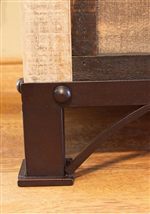 Solid pine construction is supported by a hand forged iron base to give this dresser a primitive design. 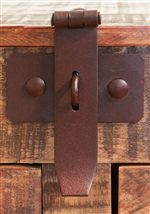 A hand distressed and wire brushed finish is paired with hand spun dark wooden knobs to give the six drawers a one-of-a-kind look. 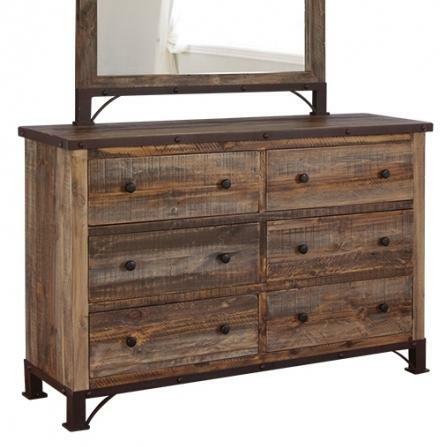 Not only can you keep your clothing tucked away neatly you can also infuse a rustic style into your home by adding this dresser. Pair with the coordinating mirror to complete the functionality of this piece. 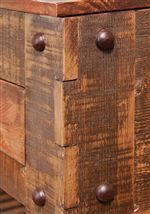 The 900 Antique Rustic 6 Drawer Dresser by International Furniture Direct at Miskelly Furniture in the Jackson, Pearl, Madison, Ridgeland, Flowood Mississippi area. Product availability may vary. Contact us for the most current availability on this product.